AUDIO: March 2, 1967... President Lyndon Johnson and Texas Gov. John Connally discuss the Jim Garrisson investigation into the assssination of President Kennedy, which directly implicated LBJ. Johnson notes one of Jimmy Hoffa’s lawyers went to one of their “mutual friends” to discuss the Garrison case; warning that Hoffa “would tell all the story” about the Kennedy assassination after November of ’67. Johnson and Conally’s cozy relations with Hoffa’s lawyers should give anyone pause for thought: At the time, Hoffa had a Mafia contract on Robert Kennedy. Hoffa's animosity towards the Kennedy brothers became legendary after Robert F. Kennedy targeted Hoffa hoping to break the Teamster Union’s ties to organized crime. The Jim Garrison investigation was of particular concern to Johnson because it implicated the CIA, and thereby his involvement, at the very least after the fact. In 1967, before he could break his silence; Hoffa was sentenced to 13 years in the federal prison for jury tampering, pension fund fraud, and conspiracy. Hoffa left prison on December 24, 1971. Hoffa disappeared after the Church Committee began an investigation into the CIA use of Mafia assassins to kill politcal leaders in 1975. March 2, 1967: The voice speaking is Johnson’s, the caller was Conally, who phoned regarding the Jim Garrison investigation into the assassination of President John F. Kennedy. Johnson notes one of Jimmy Hoffa’s lawyers went to one of their “mutual friends” to discuss the Garrison case; warning that Hoffa “would tell all the story” after November of ’67. At the time, Hoffa had a Mafia contract on Robert Kennedy. His animosity towards the Kennedy brothers became legendary after Robert F. Kennedy targeted Hoffa hoping to break the Teamster Union’s ties to organized crime. In 1967, before he could break his silence; Hoffa was sentenced to 13 years in the federal prison at Lewisburg, Pennsylvania, for jury tampering, pension fund fraud, and conspiracy. President Richard M. Nixon commuted Hoffa’s sentence, and Hoffa left prison on December 24, 1971. 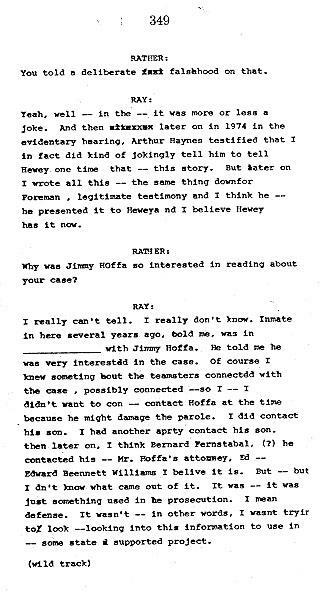 Interestingly, Hoffa took a keen interest in the investigation of a possible link between the JFK, RFK and King assassinations, as noted in this CBS transcript of Dan Rather interviewing James Earl Ray. President Kennedy and Medicare The “socialized medicine” gambit was around much longer than most people realized, and it almost killed Medicare.